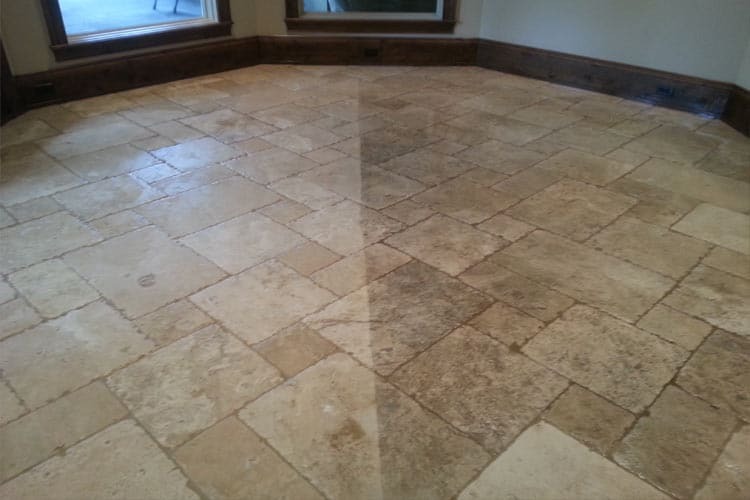 Due to its acid sensitivity, travertine must be cleaned using an alkaline cleaning solution. We give the solution approximately 20 minutes of dwell time. This gives the cleaner time to depolarize the dirt that is embedded into the stone and grout. We then use an industry accepted spinner tool which provides pressure coupled with vacuum for extraction. This process also removes dirt from the top of your grout lines. This is the industry recommended method to clean stone and tile floors. Due to its alkaline mineral content, travertine etches whenever an acidic liquid or other compound comes in contact with the surface of the stone. This includes many common cleaners. The more acidic the substance, the faster etching occurs. Travertine polishing takes care of superficial scratches and minor etching that occurs throughout the course of daily activities. 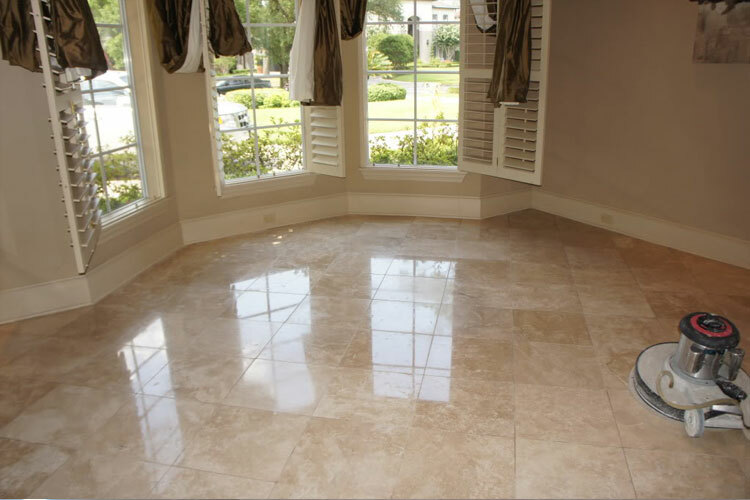 Our travertine polishing process leaves a deep, natural shine, with clarity and depth, which you just cannot achieve with an artificial coating. Travertine can be honed to a matte or satin finish through a grinding process. We can also remove severe etching and deep scratching through our travertine honing service. Honing is rarely needed to remove damage but it is often used to provide a less glossy finish to the stone. All non-polished travertine should be sealed. This includes tumbled, rustic, or honed travertine of any style or cut. At Modern Stone Care our Houston travertine sealing service uses only premium sealer which are sand fortified. Sealing a floor against water based staining is adequate for most parts of the home, but in the kitchen, we recommend sealing travertine with an oil repellent and a water repellent. 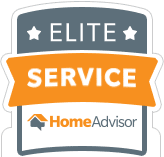 Call for details on any of our services or fill out the contact form on this page. Travertine is a terrestrial sedimentary rock formed by geothermally heated hot springs with high ph environments caused by the rapid precipitation of the mineral calcium carbonate. It is a type of limestone but is often categorized incorrectly as travertine marble. It is not marble at all, but it does share similar characteristics in that it is comprised of the same mineral – Calcium carbonate. 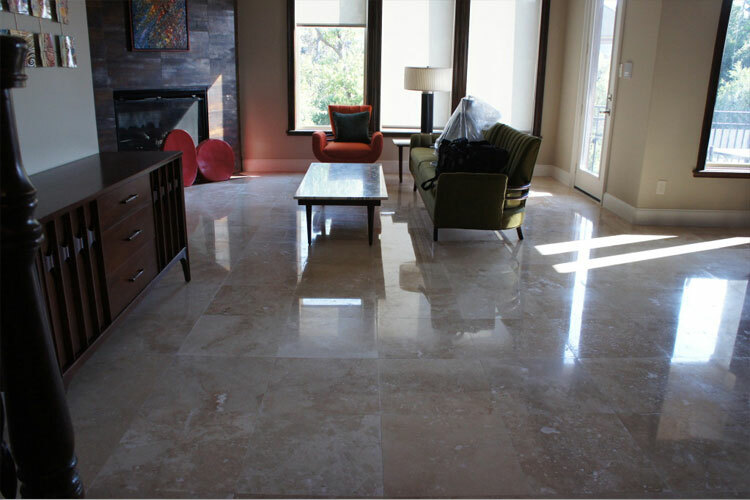 This makes travertine sensitive to acids, and it gives it the ability to be polished to a high shine. One of its main characteristics is the fact that the stone is full of holes which permeate various depths of the stone. 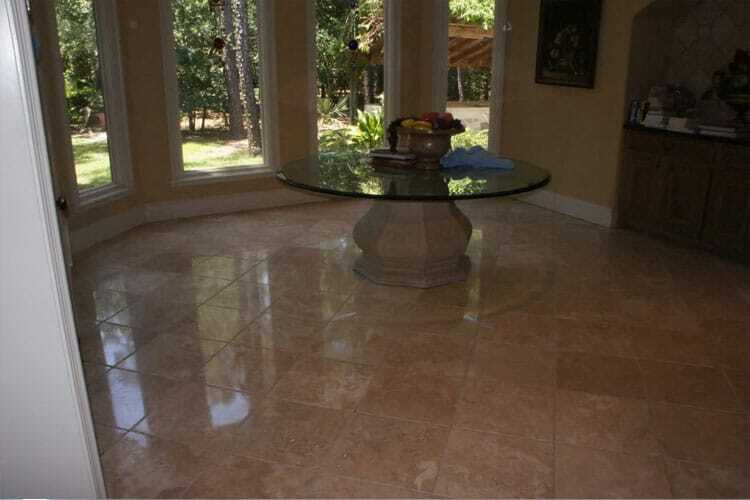 Travertine is often used for flooring in Houston and across the country. Fabricators or Manufacturers often add an epoxy filler to travertine tiles so that it can be smooth and polished. They also leave the stone unfilled at times and leave it a little rougher for a more rustic look. Either way, travertine is a beautiful, but high maintenance floor. Filled travertine is usually laid with grout lines 1/8th to 1/16th of an inch in width. The concept being that filled travertine is finished the way that it is so that it can be polished. You want as little surface area of grout as possible so there is less interruption of the shine. It usually has straight edges and can be cut as a plank (quadrilateral rectangle similar to wood) but most commonly as a square tile. It is normally laid straight and this is done to enhance the effect of the shine. Sealers are often incorrectly applied to this stone in an effort to “protect” it. Big box stores and flooring stores alike often sell water based film forming topical sealers that are applied to travertine to give it a satin or semi-gloss artificial finish. Modern Stone Care does not endorse that practice. Smooth, filled travertine should be polished. We do not believe that travertine should have a sealer applied to create an artificial look. 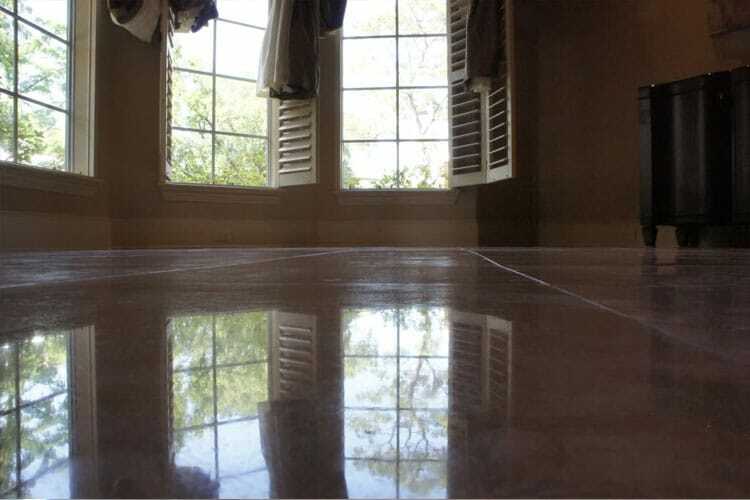 Polished travertine always looks and feels cleaner than travertine with an artificial sealer on top. Unfilled travertine or even travertine that is more rustic but filled, usually have wider grout lines and convey the traditional look of a natural stone floor. This type of travertine may be laid in many different patterns. These floors are usually honed and have a more textured finish, and of course may have holes throughout the surface of the stone. This type of travertine tile has a higher porosity than its polished counterpart. Honed, unfilled, rustic or tumbled travertine needs to be sealed due to the higher rate of absorption. We recommend sealing this stone with a quality impregnator which is made specifically for travertine, marble or limestone. These stones have no natural sand content. Most impregnators are made chemically to bond with the sand in the stone. But since travertine has no sand, these sealers will quickly become ineffective due to their poor bonding capabilities. Modern Stone Care uses premium sand fortified sealers whenever we seal these stones. 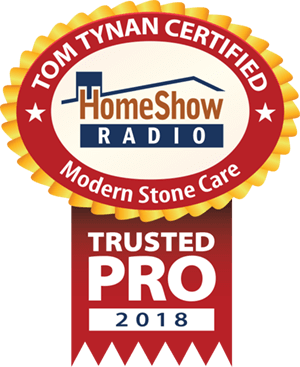 Keep in mind that sealing the stone will not keep dirt from accumulating either on the stone tile or grout, or from collecting inside the holes of the stone. It is important to remove this dirt because damp mopping is also required at least weekly. If the dirt and debris that accumulates is allowed to remain on the floor, when damp mopping occurs, that dirt is turned to mud and is pushed into the grout lines by the mop. This will make your grout lines dirty very fast. When damp mopping with soap, rinsing will be required. After mopping with any soap solution, use a different rinse mop, and go over the area again with clean water. While these floors do not need the same care from abrasion as a polished floor, they are more difficult to keep clean. In part, because of the fact that they often have open holes throughout the surface of the floor, but also because these floors always have cement based sanded grout between the tiles. Dirt will accumulate in the holes and over the textured stone. Also, the sanded grout is porous, and since it is wider, will accumulate dirt there as well. Keep in mind that sealing the stone will not keep dirt from accumulating either on the stone or grout or from collecting inside the holes of the stone. 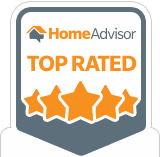 For this reason Modern Stone Care recommends that you have your unfilled travertine floors professionally cleaned twice per year.